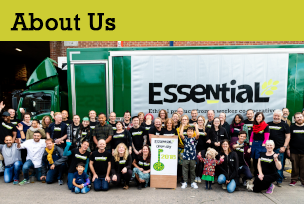 The Essential brand comprises a wide range of organic and sustainable store-cupboard essentials developed in accordance with Fairtrade, biodynamic, ethical and co-operative principles. All Essential products are vegetarian or vegan, GM-free and have no unnecessary additives. The Essential brand is not supplied to supermarkets; offering independent retailers a genuine point of difference and added value to customers. The Essential coconut range is sustainably sourced from co-operative farms. Organically grown in Sri Lanka, these products give local farmers a sustainable income. The fresh coconut is pressed and packed at source which ensures that the local economy benefits from all aspects of the production process. 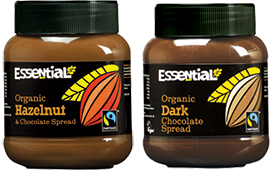 The Essential Organic Fairtrade Chocolate Spread range is made from cocoa beans that are produced sustainably in Ghana. The beans are harvested and processed without the use of slave or child labour and no GMOs or artificial additives are used. Approved by the Fairtrade Foundation, there are three delicious varieties available. Biodynamic, Fairtrade and Organic Infusions produced on Egyptian farms that adhere to strict biodynamic principles. These teas are grown on reclaimed desert land and sustain the livelihoods of thousands. Unbleached teabags. An iconic range made only from the best organic peanuts. A choice of crunchy and smooth, with or without added salt. 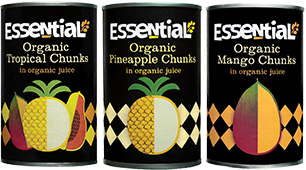 Essential organic fruit chunks are simply in organic fruit juice with no added sugar, preservatives or additives. All are produced, prepared and canned by a sustainable co-operative in Sri Lanka that supports the post-Tsunami economy, ensuring that all profit remains at source. Essential Yeast Extract has a superb, relatively subtle flavour. It is lower in salt than other yeast extracts as it is produced naturally by autolysis. It is also gluten free as it is processed from roots instead of grain and has no added MSG. A delicious range of organic, wholesome flapjacks, including four vegan flavours. Available in single flavour or mixed flavour cases. 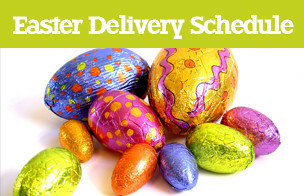 Sourced from a company local to the Essential HQ in Bristol. One for every day of the week! Essential's luxury cereals comprise a choice of three mueslis, two granolas and two crunchy cereals. Each is packed with a nutritious combination selected from natural flakes, barley, puffed rice, fruit, nuts, seeds and, in one cereal, raw cacao nibs. 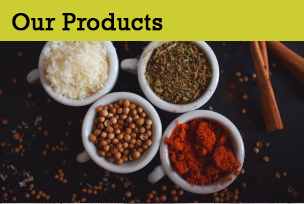 The Essential ingredients range includes hundreds of varieties of natural wholefoods including rice, pulses, dried fruit, nuts, seeds, herbs and spices. Sizes range from 125g up to 25kg. 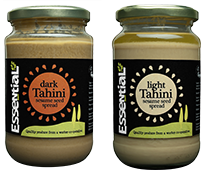 A highly popular and versatile product, the Essential tahini comes in a choice of Toasted Hulled and nutrient rich Toasted Unhulled. 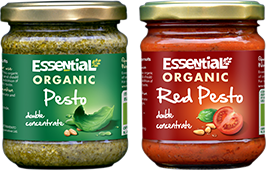 The three Essential Organic Vegan Pesto sauces are all concentrated so twice as economical to use: simply add extra-virgin olive oil to taste. Three variations on the classic recipe of basil, pine nuts, extra-virgin olive oil and sea salt. 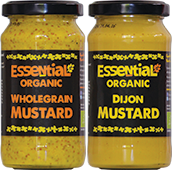 Two mustards to tickle the taste buds. Everything you want from a mustard, but organic. These tomatoes are grown and packed in the South of Italy. Certified organic to EU standards and the Organic Farmers & Growers Association UK. No BPAs in the product or packaging. Our high quality vegetable and tomato soup with a home made feel and taste, in big jars enough for two greedy people. With no added sugar, virtually fat free and 100% organic. We have a choice of wholemeal and white pasta in a variety of shapes to suit all tastes and dishes. Sourced from an Italian Co-operative. Essential has a range of 40 herbs and spices in convenient home kitchen sizes. Seven Fairtrade varieties.